There is a superfood emerging which is a kind of seaweed, is rich in mineral content, vitamins, and protein, and is said to emulate the smoky taste of bacon. 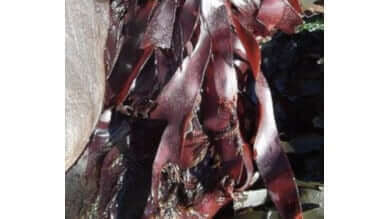 Pink dulse, otherwise known as palmaria mollis, was initially cultivated in order to feed abalone by researchers in Oregon, who later discovered that the new strain of red seaweed tastes like bacon when fried. The researchers at Oregon State University Food Innovation Center have now patented palmaria mollis and are looking into methods to grow the plant on a commercial scale for human consumption. Recipes are being trialled for pink dulse veggie burgers and more. Dulse is high in protein and due to its unique umami flavour has been used in traditional Irish, Icelandic and Scandinavian cuisines. It is known to help a variety of health issues including thyroid problems, for which the high levels of iodine are beneficial. Seaweed is easily cultivated and is able to thrive in waters containing elevated levels of carbon dioxide. Given what Impossible Food CEO Pat Brown recently said of meat-eaters – “If you ask a hundred meat eaters, ‘Is the fact that your meat is made from the corpse of an animal part of what you value about it?’ Approximately zero of them will say yes” … could this bacon of the sea eventually become the nail in the coffin for the agriculture of pigs for food?